Most of life is made up of the ordinary, everyday things – getting up, having breakfast, going to work or school. But occasionally things happen we don’t expect. They can be the trivial, like being delayed for two days on a journey, or they can be serious: loss of a job, death of a loved one. These are all part of what it means to be alive, to be human. What counts in any of these situations is not the problem itself – however serious that may be – but our reaction to the problem. Quite often we react with a moan or a complaint – a ‘why me?’ But is that the response we ought to have as Christians? Is that a truly biblical response? I think that something of how we ought to react in difficult situations is to be found in Psalm 93. The psalm starts with a statement that is fundamental to our faith, that the Lord reigns. If we are to deal with anything in our lives (whether good or bad), we need to start at this point: that God is sovereign. As soon as we lose sight of this truth, then we lose all perspective; even trivial issues can seem difficult or even overwhelming. This transcendence of God is not something that should discourage us, rather it is in this ‘otherness’ of God that we should find comfort and encouragement. Unlike us, God is not subject to doubt or swayed by situations. His majesty, his rule is firm and secure and to be relied upon. So the psalmist repeats this thought – just to make sure it has sunk in – and expands it by reminding us that not only is God King, he is a king with real strength. Our God can be relied upon because of that strength, because he is all-powerful. The writer then turns our attention to the earth and we probably wonder why. I think there is a very simple but important reason for this. We cannot see God and therefore our ability to understand just how trustworthy, reliable and strong he is may be somewhat limited. However, we can see the earth – or at least part of it. As we look at the earth we realise that it is secure, it cannot be moved. If the earth, part of God’s own creation, is secure, how much more secure and dependable is the God who created that earth. He is dependable because he is on the throne and because that throne is not something that comes and goes. This is not the latest music or film sensation – here today gone tomorrow – this is the creator of the universe whose throne is from eternity and will continue to eternity. What the writer is saying is ‘look up’, see the God you worship for who he truly is: trustworthy, majestic, powerful and eternal. Does this mean that trouble and problems don’t arise in our lives? Or that those difficulties are not real, sometimes painful? No, it doesn’t, and it is exactly that which the psalmist then shows us. He has already drawn our attention to the earth to emphasise God’s trustworthiness, now he turns to the sea, but why? 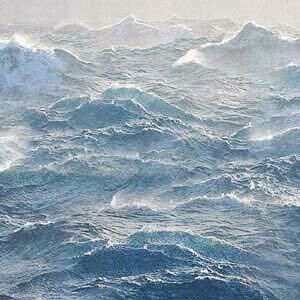 The sea is a picture of chaos, of those forces that threaten us that are powerful and seemingly out of control. In the myths of the nations around Israel, the sea was sometimes portrayed as a monster, a fearful thing. This is understandable, the sea is dangerous, untameable, as anyone who has been on a boat in a storm will recognise. So in Daniel 7, Daniel sees four monsters come out of a stormy sea to threaten the people of God. In Genesis 1, it is over the waters of chaos that God’s Spirit hovers and it is out of this chaos that God creates the world. He brings order where there was disorder, shape where there was emptiness. In Daniel’s vision, once the monsters have been described he then sees the throne of God being put in place. Even over such disorder, threat and chaos God is sovereign, he rules. Here in Psalm 93 we see that the worst the sea can throw at us is nothing compared to the power of our God. Nothing this life can throw at us is more powerful than our God. Safety and security are to be found in God and him alone for his laws remain secure. His holiness, his majesty, what makes God ‘other’ can be relied upon. And can be relied upon not just for today, but through endless days. So whatever the situation, good, bad or indifferent; whatever the difficulties or trials, look up! See God for who he is.